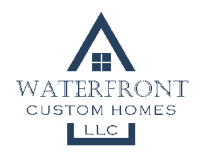 At Waterfront Custom Homes, LLC, our number one goal is to make your home building experience affordable and positive. We work with the home owner to help you visualize your project from start to finish. We can work with and manage any team of designers and artisans that your project requires. Quality construction is the top priority of Waterfront Custom Homes. We demand the absolute best from our subcontractors, suppliers, and ourselves. Open and honest communication is a key component of our construction process. Clients are provided with an initial line-by-line estimate to help them better understand construction budgets and the overall construction process. Our clients know exactly what is going on in the process at all times through weekly to daily updates at critical phases. We are proud to offer our in-house design consultation services to our clients free of charge. Clients are provided assistance with plumbing selections, flooring, countertops, lighting, hardware, paint colors and finishes, custom furnishing & accessories. Waterfront Custom Homes, LLC was founded by its owners Ryan Crum and Noah Wilson in 2013. We are licensed and insured in both Louisiana and Mississippi. Ryan holds a degree in Construction Management from Louisiana State University. He has over 10 years of construction experience in commercial and residential construction. Ryan partnered with Noah in August of 2012 in his existing business, Waterfront Construction. Ryan and his wife, Brooke, have two girls, Lily and Sasha, and reside in Vidalia, Louisiana. Noah attended the University of Louisiana at Monroe where he studied construction management. He established Waterfront Construction of Louisiana in 2004 to serve the needs of the surrounding community in pier and seawall construction. This business is still active and staying busy today serving the needs of Lake Concordia, Lake St. John, and other communities as the need arises. Noah and his wife Meghan have one son Brann, and reside in Monterey, Louisiana.